Being pale and freckled my entire life, I've become quite an expert at finding the least-gross-feeling ways of wearing SPF. After all, if it feels gross and sticky, I'm not likely to wear it...and that means sunburns are in my future. 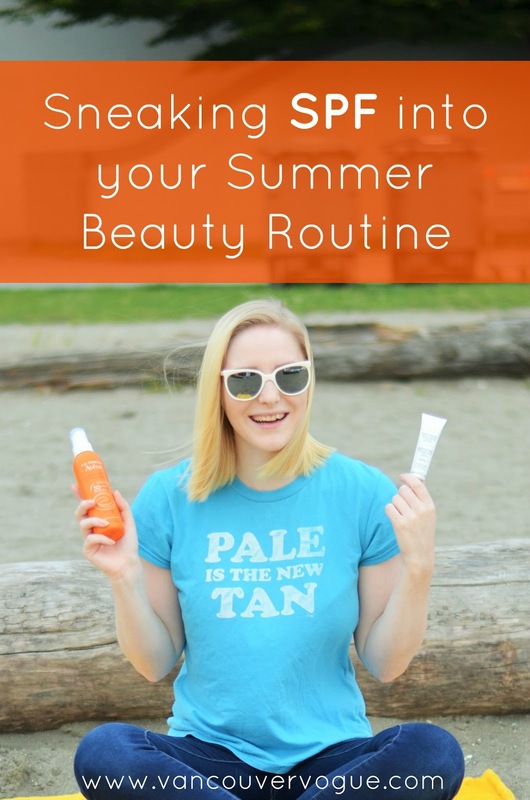 Especially after last summer, when temperatures hit record highs, I started taking a closer look at all the options out there, from skincare to makeup, to see how I could start changing up my summer beauty routine! I think it's safe to say that the reason most people hate sunscreen is texture. You buy the cheap stuff, and it feels sticky, greasy, and it just gets even worse when you start sweating. Now, I'm not here to tell you I've found a miracle solution, but I can guarantee you that if you invest is the "derm" brands that are a bit pricier, the texture is waaaay better! I got this High Protection Spray with SPF 50 from Avène (available at London Drugs) a few weeks ago, and have been really happy with it. So far, it's the best sunscreen I've used in my 25 years of being pale! You can definitely use a regular sunscreen on your face (although you should make sure to apply with care around your eyes), but I really don't love the feeling. Especially once I start sweating, it certainly isn't keeping my face mattified. A London Drugs Beauty Advisor introduced me to the Lise Watier Sun Smart Universal UV Shield (available at London Drugs) over a year ago, and it has become my absolute go-to for summer! I can't get over how amazing the texture is, and how it doesn't smell the least bit like sunscreen. I actually think it feels better on my skin than most of my face primers! It keeps skin protected with SPF 30, while also keeping it perfectly mattified and prepped for foundation. Next step for me after applying the Lise Watier Sun Smart is a BB Cream. I've searched for a long time before finding a BB Cream that actually matched my skin tone, and was so happy to find a match in their M Perfect Cover line (available online at Missha Canada and H Mart). I'm No. 13 for your reference. The BB Cream has an SPF of 42, although it actually isn't approved in Canada. When I purchased it at my local H Mart, it came with a little sticker stuck over the SPF label on the bottle. I've heard that Canadian requirements for SPF are really strict, and a lot of companies opt to not go through all the hoops to be able to label their products with SPF in Canada. I lived most of my life without ever burning my lips in the sun, so I just never really bothered to protect them. But when I went to Texas last year, I got one of the worst burns I've ever had, head to toe, and even my lips burned. It was not a pleasant experience, let me tell you. Ever since that, I keep a stick of lip balm with SPF in my purse all the times! RoC's Soleil Protexion Plus Lip Balm (available at London Drugs and drugstores) has SPF 30, and keeps my lips nice and soft. I don't like the idea of sacrificing colour in my makeup routine just because I need to wear SPF. On days when I want a tinted lip balm, I reach for my L'Oreal Colour Riche Lip Balm (available at London Drugs and drugstores). I have the shade Caring Coral, and it's the perfect touch of pink/orange colour that's packed with moisture and shine. I love how it looks with a fresh-faced summer look! Mascara, a dab of creamy coral blush, a swipe of this lip balm, and I'm good to go! The most important feature though, of course, is the SPF 15. With the exception of a whole truckload more freckles, I intend to come out of summer with my skin looking the same as before, thanks to these SPF favourites! No wrinkly, leathery skin in my future, no thank you. If you've got some SPF favourites, let me know in the comments! I'm always searching for the latest and greatest.